Citation Information: J Clin Invest. 2007;117(2):364-374. https://doi.org/10.1172/JCI30376. The role of the cystic fibrosis transmembrane conductance regulator (CFTR) as a cAMP-dependent chloride channel on the apical membrane of epithelia is well established. However, the processes by which CFTR is regulated on the cell surface are not clear. Here we report the identification of a protein-protein interaction between CFTR and the cytoskeletal filamin proteins. Using proteomic approaches, we identified filamins as proteins that associate with the extreme CFTR N terminus. Furthermore, we identified a disease-causing missense mutation in CFTR, serine 13 to phenylalanine (S13F), which disrupted this interaction. In cells, filamins tethered plasma membrane CFTR to the underlying actin network. This interaction stabilized CFTR at the cell surface and regulated the plasma membrane dynamics and confinement of the channel. In the absence of filamin binding, CFTR was internalized from the cell surface, where it prematurely accumulated in lysosomes and was ultimately degraded. Our data demonstrate what we believe to be a previously unrecognized role for the CFTR N terminus in the regulation of the plasma membrane stability and metabolic stability of CFTR. In addition, we elucidate the molecular defect associated with the S13F mutation. Analysis of N-terminal CFTR mutations. (A) Comparison of amino acids 1–25 of human CFTR with those of other species. Residues conserved in all species are shaded black. Disease-causing missense mutations in CFTR identified from the CF mutation database are indicated above. 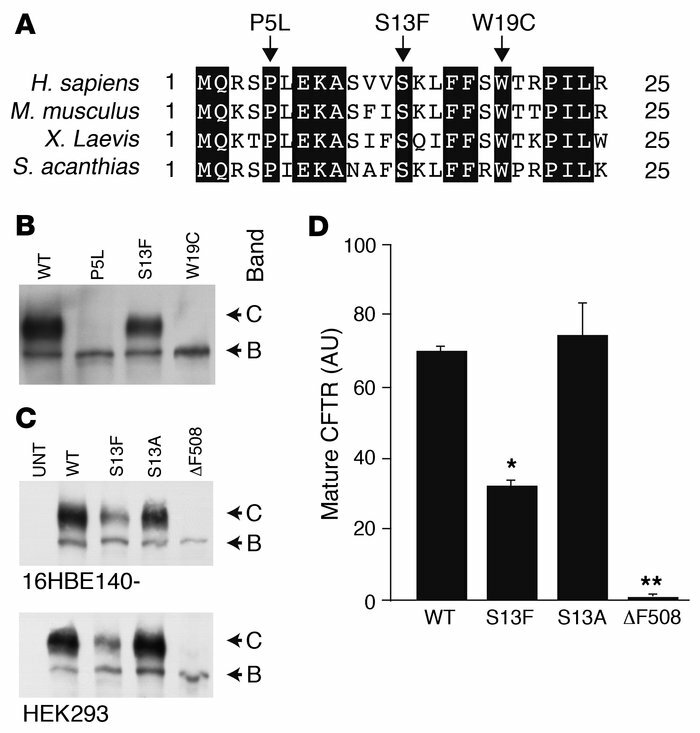 (B and C) The indicated CFTR proteins were expressed in HEK293 or 16HBE140- cells and analyzed by Western blot. Untransfected cells (UNT) served as negative controls. (D) Data from HEK293 cells in C was quantitated using densitometry. For all CFTR proteins, the level of mature band C CFTR was normalized to that of band B CFTR. *P < 0.01, **P < 0.001 versus WT CFTR. n = 3.